United States. Congress. Senate. Committee on Public Works. "Robert F. Wagner to Edmund S. Muskie Regarding S. 306." Robert F. Wagner to Edmund S. Muskie Regarding S. 306, January 18, 1965; filed with Muskie to Wagner, February 1, 1965, “S. 306 Miscl. Corresp. Re air pollution” folder, Legislative Files, Box 3; Committee on Public Works; 89th Congress; Records of the U.S. Senate, RG 46; National Archives.. Accessed 19 April 2019. http://acsc.lib.udel.edu/items/show/320. Robert F. Wagner to Edmund S. Muskie Regarding S. 306, January 18, 1965; filed with Muskie to Wagner, February 1, 1965, “S. 306 Miscl. Corresp. 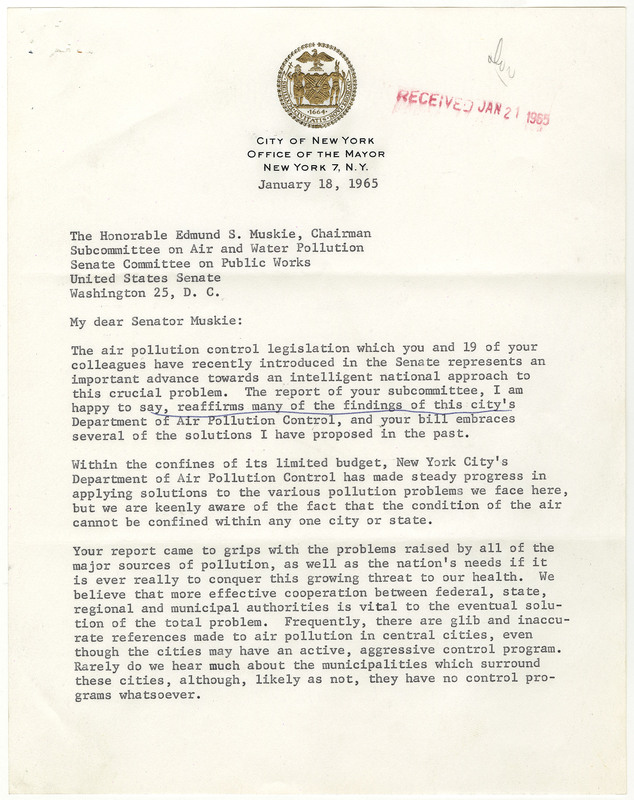 Re air pollution” folder, Legislative Files, Box 3; Committee on Public Works; 89th Congress; Records of the U.S. Senate, RG 46; National Archives.